China has signed a contract with Rosoboronexport for the supply of S-400 air defense systems, the company’s managing director Anatoly Isaikin has confirmed in an interview with the Kommersant business daily. "I will not disclose details of the deal but, indeed, China has become the first buyer of this latest Russian air defense system, which highlights the strategic level of our mutual relations," said Isaikin when asked whether it was true that in September 2014 Beijing signed a contract for the purchase of four S-400 battalions. 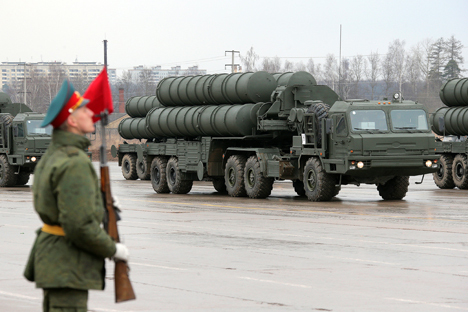 Isaikin went on to add that "many countries" were eager to purchase the S-400, although the Russian defense industry, specifically the Almaz-Antey concern, was under obligation to primarily supply the new system for the needs of the Russian Defense Ministry. "Even given their expanded production capacities, it is difficult to manufacture these systems for several countries at the same time. China has become the pioneer in this respect," he added. Asked whether Russian enterprises were wary of entering into cooperation with Chinese companies, the Rosoboronexport head said he believed that if the Russian side was working in China's interests, it was "working in its own interests too." The S-400 Triumf is a multichannel surface-to-air missile system capable of hitting all existing airborne threats, including airplanes, helicopters, unmanned aerial vehicles, cruise missile and tactical ballistic missiles with maximum speeds of up to 4,800 meters per second. The system came into service with the Russian Armed Forces in April 2007.